Creation: Appeared in late 1926 as an original US Highway, running from US 11/VA 33 New Market to US 50/VA 36 Fairfax. In this routing, US 211 was added to VA 21. Adjustments: About 1928, US 211 was extended east to Washington DC via Falls Church and Arlington to the Key Bridge, replacing a rerouted US 50 and as an add-on to the rest of VA 21. 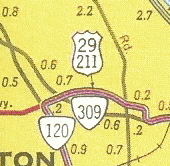 About 1930, US 211 was placed on a new bypass of Sperryville, leaving behind what I believe was VA 37Y (now SR 1001) and CR 111 (now SRs 1002/1003). About 1933, US 211 was placed on a bypass of Fairfax. The old route into central Fairfax remained part of US 50 (now VA 236) and Old Lee Hwy leaving Fairfax became VA 236 (now unnumbered). About 1937, US 211 was placed on a bypass around the north side of Warrenton, leaving behind US 211 ALT (now mostly US 211 Bus plus Old Alexandria Pike). See scan under US 211 ALT entry below. In Dec 1947 (CTB), US 29-211 was removed from the SR 674/693 loop at New Baltimore. In Feb 1951 (CTB), US 211 was given its current New Market routing to the north of downtown, leaving behind SR 1002. In Nov 1952 (CTB), US 211 was removed from the SR 766 loop through Hamburg west of Luray. In March 1959 (CTB), US 211 was rebuilt on the west slope of Massanutten Mtn, leaving behind SR 674 and several abandoned alignments. In 1960-61, US 29-211 and VA 309 swapped alignments to today's configuration. US 29-211 had used Lee Hwy all the way through here. In Nov 1964 (CTB), US 211 west was extended over US 11 and duplexed with VA 260 out to I-81. In March 1967 (CTB), US 211 was removed from SR 675 at Massies Corner. In April 1970 (CTB), US 211 was removed from SR 678 loop east of Ben Venue and SR 679 loop east of Massies Corner. In Oct 1971 (CTB), US 211 was removed from SR 683 east of Washington, VA.
About 1971, US 211 was placed on its bypass of Washington, VA leaving behind US 211 Business. In Jan 1972 (CTB), US 211 was given its bypass around Luray, leaving behind US 211 Business. In July 1980 (CTB), US 211 east was truncated to its current end in Warrenton, ;leaving behind US 29. Improvements: US 211 was paved upon inception everywhere except from about Amissville to the Rappahannock River. US 211 was fully paved in 1930. The first multilaning of US 211 occurred between 1941-47, from Fairfax Circle west to the current 2-lane segment of US 29 approaching Manassas Battlefield. In 1954, US 211 was multilaned from about VA 215 to US 15 NB. In 1957, US 211 was multilaned from US 15 to VA 55. 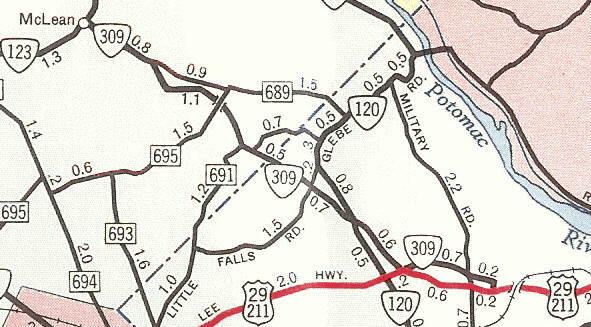 In 1960 or 1961, US 211 was 4-laned from VA 120 to VA 124; also incorrectly shown to be 4-laned undivided through Manassas Battlefield (until 1975 issue on insets; 1981 on the main maps). In 1962, US 211 was 4-laned from VA 120 west to VA 237 Falls Church. In 1965, US 211 was widended west to the WCL of Falls Church. 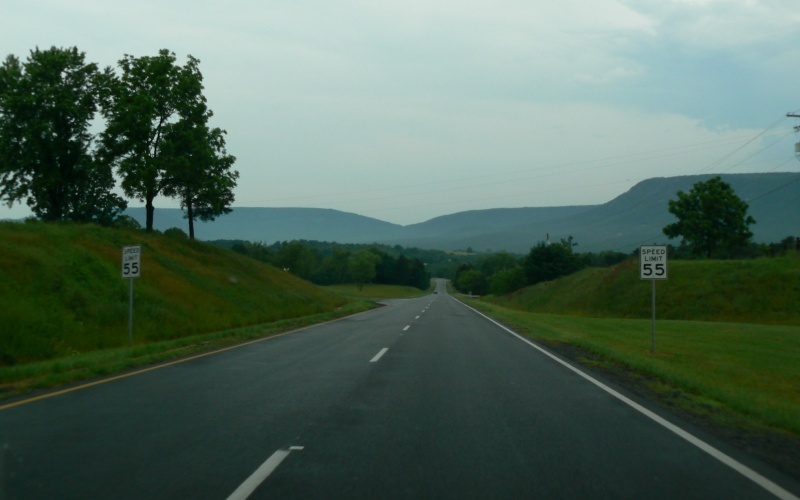 In 1967, US 211 was 4-laned from Luray east to the bottom of Thorton Gap ascent. In 1968, US 211 was 4-laned from east of Washington, VA to 3 miles west of Ben Venue. In 1969, the widening in 1968 was extended east 5 miles. In 1972, US 211 was 4-laned on the Luray Bypass. In 1979, US 211 was 4-laned from Ben Venue to Amissville. In 1993 or 1994, US 211 was 4-laned from Washington VA west to nearly Sperryville. US 211 is 3-lanes over both mountain crossings, so the only 2-lane segments left are I-81 to SR 1002 in New Market and also from Sperryville west to the mountain ascent heading for Thorton Gap. Posted: Fully posted; the last known cutouts on mainline US 211 were removed in the late 1990s. Comment: US 211 is one of the shortest US routes in the country. It is a little weird to have US 211 east end at its Business route instead of the US 15-17-29 Bypass. 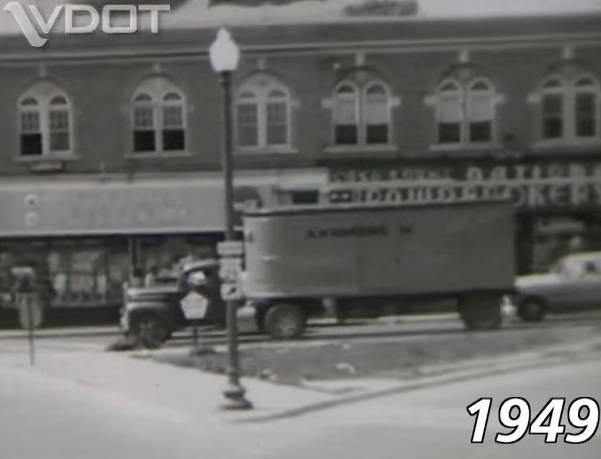 The 1928-1929 Official Maps misidentify this as US 311 in the Washington/Alexandria inset. View Froggie's westbound photo journey of US 211. Creation: Designated about 1971 as a renumbering of mainline US 211 through Washington. Posted: Fully posted; WB there was no posting telling you to turn left at SR 622 last time I was threr in 2008. Comment: The identity-challenged town of Washington is almost always referred to as Washington Va on road signs. Rather unfortunate when you consider this is the oldest of all of the Washingtons in the US, having been platted by George himself in the 1740's. Note that US 522 Business is not posted at all. Creation: Designated Jan 1972 (CTB) as a renumbering of mainline US 211 through Luray. Improvements: Paved upon inception; the easternmost 1+ miles are 4-laned which predates the business designation. Posted: Fully posted; 4 cutout shields remained downtown as of summer 2010. The reassurance cutouts each way leaving US 340 Business are now all there is as of 2014. Comment: US 211 Business in Luray is a little hilly. The west end of US 211 BUsiness is essentially next to Luray Caverns. Creation: Designated around 1973 as a renumbering of US 211 ALT through Warrenton. US 211 Business originally ended where US 15-17-29 Bypass currently intersects US 15-29 Business northeast of Warrenton. Adjustments: In Feb 1980 (CTB), US 15-211 Bus was rerouted off Alexandra Pike onto Blackwell Rd. to reconnect with US 29-211. Posted: Fully posted; 2 VA 211 Business shields exist at the US 15 Business split at the courthouse. US 211 ALT: Appeared about 1937 when mainline US 211 was placed on a new bypass north around Warrenton. US 211 ALT was renumbered as US 211 Business around 1973.